But lets talk about the movie as a movie. Elysium opens up strong, and surprisingly slow, allowing us to get to know and care for our hero, Max, a boy who promises his best friend, Frey, that he will take her to Elysium — the man-made torus floating in orbit around the Earth, built by the rich to get them away from the overpopulated, polluted squalor of the Earth surface. Elysium lifestyle is utopian, where there are no problems or sickness, helped in large part by technology that can cure nearly everything except for brain death. But things don’t go too well for Max, and he ends up with a criminal record for stealing cars, and he ends up working in a factory, trying to keep his nose down and out of trouble. 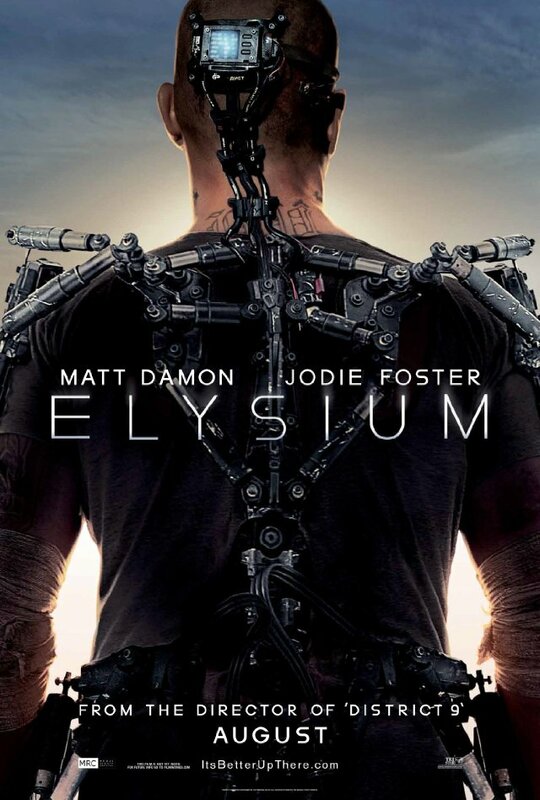 After a lethal dose of radiation in an on-the-job accident, Max turns to his connections in the criminal underground to get him to Elysium so he can heal himself. Head criminal/revolutionary freedom fighter Spider, agrees to help Max, but on condition that he does one last job. The first step into a spiral of worn-out story conceits that happen when you direct a great movie and the studios give you LOTS of money to make another — and then insist on telling you how to make a movie. To help Max with his dying body, Spider’s team retrofits him with an exoskeleton that will make him as strong as the mechanical police force they will have to fight. So, now he is a superhero, albeit a flawed one — because his motivation is completely self-serving…the beginning of his arc. But who is the foil? The callous politician Delacourt (Foster)? The CEO that didn’t care about Max’s welfare after the accident? Most likely, it is in the form of a sleeper agent Kruger (Copley) working within the Earthbound society, used by Delacourt to maintain chaos and remove Elysium from blame. So, Elysium becomes represented by the militaristic insanity of a violent, misogynistic ex-special agent. This would be fine in a Chuck Norris flick — not as much in a potentially smart, socially conscious film. Again, it detracts from the message and doesn’t allow it to hit the heart. Act 2 is a nice game of cat and mouse, where Max is trying to evade Kruger and his men. We get to know Frey and her daughter, Matilda. Max gets to gain a little insight and reflection on being “a hippo”, which pushes him further down his character arc. Then Act 3. Ugh. Act 3. Act 3 crashes like Kruger’s out of control ship crashes into the serene pools and crafted topiary of Elysium. It dives into the typical summer fare that we have gotten used to and, hopefully, grown tired of. Running gun battles. Man against man fighting in exo-skeletons. Lots of hand-held camerawork to hide the fact that actors can’t really fight very well in practical exoskeletons. And an ending that feels so easily obtained and ridiculous that people who AREN’T away of the complexities of the issues, will say “SEE!?!? Look how easy it is to solve this problem” But really, the answer isn’t as simple as saying “repairum diseaseasum”. Like District 9, the production value is tops. Visual effects work led by Image Engine (the guys who handled most of D9) is seamless. Not to leave out the supporting FX teams at Whiskytree, The Embassy, ILM, and others. Plus, WETA Workshop put their hand in for the practical robot stuff and makeup work. The camera work goes handheld quite a bit, especially, like I mentioned, in Act 3, but the DP never noticeably falls into the non-sensical pop-zooms that seems to be so popular and distracting. Although, much of the CG work around Elysium utilizes long-lenses to good effect. District 9 was supposed to feel like a documentary, so it was shot as such. Blomkamp and DP Trent Opaloch went with the idea that Elysium is a film, and shot it that way. Thankfully. All in all, the film as a film is entertaining enough that its worth a viewing. As social commentary, it feels like choking on the message. I like a bit of room for seeing issues from both sides.